About me"..the real message Bram Stoker sought to convey in "Dracula" is that a human being needs to live hundreds and hundreds of years to get all his reading done; that Count Dracula, basically nothing more than a misunderstood bookworm, was draining blood from the necks of 10,000 hapless virgins not because he was the apotheosis of pure evil but because it was the only way he could live long enough to polish off his extensive reading list." sondern dass sie es verschlingt." 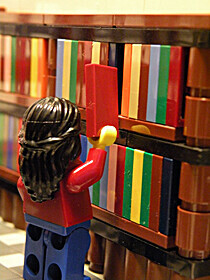 About my library"Even when reading is impossible, the presence of books acquired produces such an ecstasy that the buying of more books than one can read is nothing less than the soul reaching towards infinity... we cherish books even if unread, their mere presence exudes comfort, their ready access, reassurance."